For Anthony, it’s Asian pears. For Bryan, it’s cucumbers, and for Vanessa, pomegranates. 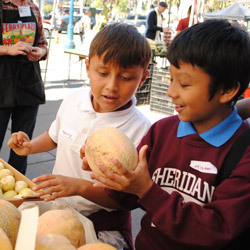 For the fourth-graders of Sheridan Elementary School, it’s a day of many firsts at the Ferry Plaza Farmers Market. School is back in session, which means a fresh crop of students for CUESA’s Foodwise Kids program, a farmers-market-field-trip-plus-cooking-class offered for free to SFUSD elementary schools. Since the program launched in fall of 2012, it has served more than 1,700 students, and the demand keeps growing. CUESA hopes to raise enough funds to double the number of students served and add a summer camp component, which is why Foodwise Kids will be in the spotlight at CUESA’s annual Sunday Supper gala on October 5, a fundraiser that generates more than half of the budget for the nonprofit’s education programs. This is not the first time Nocedal has brought a class to the farmers market for Foodwise Kids. “There are many reasons I love this program,” she says, listing numerous lessons the two-hour field trip touches on: independent living skills, teamwork, consensus building, decision making, problem solving, and math. After an introduction to the farmers market, the children venture out in groups with a handful of market tokens to select produce for their cooking class. For low-income kids living in an expensive city like San Francisco, access to fresh fruits and vegetables is often limited. About 32,000 (62%) of SFUSD students are eligible for free and reduced-price meals, according to 2013 report from the San Francisco Food Security Task Force. “This program presents a chance for us to instill a positive relationship with healthy food for kids who may be bombarded by a lot of different messages from the media and their environment about what foods to eat,” says Theresa Salcedo, CUESA’s new Foodwise Kids program coordinator. Salcedo, who started as a Foodwise Kids intern in 2013, was hired this fall to coordinate the program, bringing with her experiences from other community-based nutrition and cooking programs. Though she’s worked with cooks and eaters young and old, she’s felt most gratified watching kids’ taste buds and imaginations awaken at the farmers market. 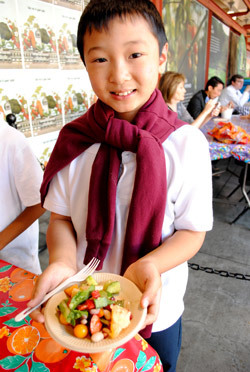 While Foodwise Kids provides an exciting first taste for many young eaters, the two-hour field trip is ripe for growth. 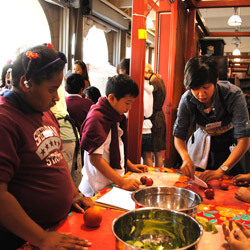 In addition to doubling the program to offer two classes on Tuesday and Thursday in 2015, for a total of nearly a hundred classes each year, CUESA plans to partner with Bay Leaf Kitchen to extend the program into the summer months and offer more opportunities for kids to take their food lessons home. 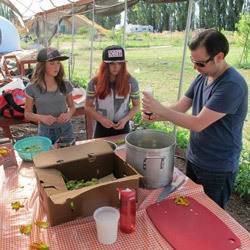 Chef Francis Hogan of Bluestem Brasserie got his hands dirty with Bay Leaf Kitchen this summer as a guest instructor at the camp’s sleepover at Eatwell Farm, where, he says, “the kids were able to pick vegetables, allowing them to really see where their food comes from and how much better it tastes straight from the field.” He then walked them through making a four-course meal with the veggies they’d just harvested. To give us a taste of the impact of these programs, junior chefs will be preparing and serving a seasonal dish of their own creation at the Sunday Supper reception: smashed roasted winter squash with a corn and herb salsa. Salcedo, who has also worked closely with Bay Leaf Kitchen, is looking forward to deepening the collaboration to create more lasting impact through Foodwise Kids. Please help grow Foodwise Kids by joining us at Sunday Supper on October 5 or by making an online donation! Photo of Bay Leaf Kitchen and Francis Hogan by Erin Euser.